Gay rugby club The Emerald Warriors are the host team for the huge sporting event which takes place in June. 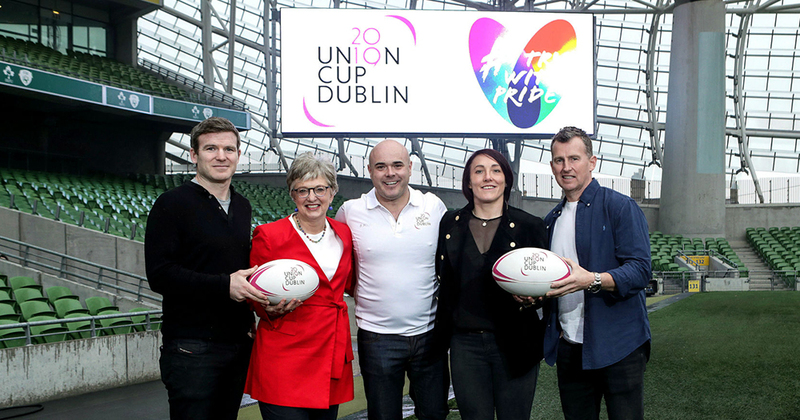 In huge news for the Irish LGBT+ sporting community, Dublin is set to play host to the Union Cup 2019 – Europe’s biggest LGBT+ inclusive rugby tournament. Host team, the Emerald Warriors, won the bid to welcome 45 teams from 15 countries to Ireland – all converging on Dublin’s DCU from June 7 – 9 for the two day festival and celebration of rugby. On hand at the launch in the Aviva Stadium were Richie Fagan of the Warriors, Minister Katherine Zappone, celebrated sportspeople Lindsay Peat and Gordon D’Arcy and refereeing legend Nigel Owens. It was also announced that this year, for the first time, there will be a dedicated women’s tournament – the Union Cup Women’s Cup. Fagan also offered the slightly sobering statistics that over 80% of LGBT+ people reported experiencing homophobic insults while participating in sports and over half of LGBT+ people are not active enough to maintain good health. Events such as this are the perfect way to combat that prejudice and inspire future sportspeople. Lindsay Peat, the Ireland international rugby player, and Nigel Owens, the international rugby union referee, are ambassadors for this years Cup, with Owens lined up to officiate the final.